Cuanbeg, when translated from Irish, means ‘Little Haven'. It is an authentic, traditional Irish cottage which was originally constructed in the 1930’s. It has been beautifully restored and now offers a unique experience combining all of the charm and tradition that you would expect of a cottage with the highest levels of luxury and comfort, including a state of the art hot tub offering the perfect way to relax and unwind after a hard day, at the beach, walking, fishing or golfing. Cuanbeg has 3 double bedrooms which can comfortably sleep 8 people with the addition of 2 fold out beds. The main bedroom is en suite and there is also a communal bathroom incorporating a bath and separate power shower. The traditional appearance of the newly fitted kitchen cleverly houses all of the conveniences one could wish for, including a range style cooker, double oven, microwave, dishwasher and a large fridge freezer. 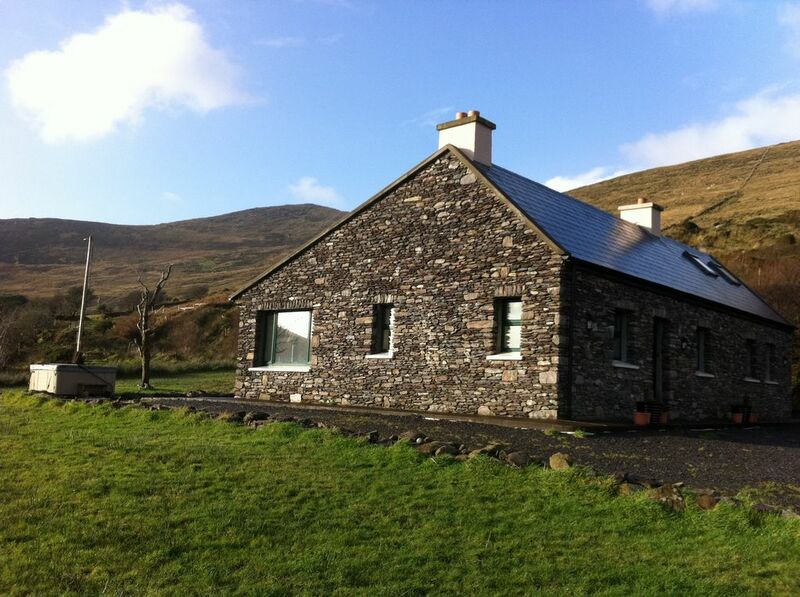 This is a lovely peaceful cottage to stay in for your trip to Kerry. It is in a great position for exploring the area, for which you will need a car. The kitchen was well equipped although some chipped crockery could do with replacing, and the dining area was comfortable and spacious for eating and for board game playing. The lounge has plenty of seating for a family of 4 although the sofas are not quite as inviting as they look in the photos. They are tired and old and covered with throws. The bedrooms were very comfortable and spacious, but the bathroom shower cubicles could do with a revamp as they are quite blackened with mould in places. Some hand soap at each sink would have been helpful. The views are absolutely breathtaking and the big windows in the lounge area help you to appreciate that even when the weather isn't so good. Relaxing in the hot tub after a day exploring the beautiful county of Kerry is something I'll never forget - its a fabulous way to totally chill out. Again the outside furniture does not look like it does in the photos, its tired and worn, but thats what happens to outside furniture, especially in Ireland! Gillian, the owner who was easily contactable by phone and email, was extremely kind, helpful and informative, before and during our stay. It would have been helpful to have had an easy way to contact the caretaker of the property who lived nearby however, as his visits were often a surprise and made me feel a little on edge for the week. But there were a few minor things that he needed to attend to that don't usually affect the property, it was just our bad luck! All in all, we loved the peace, tranquillity and comfort (and the hot tub!) of this cottage and would definitely recommend it. We stayed at Gillian's beautiful home for 4 nights. There were 5 adults (two couples and a single) and we were perfectly comfortable in the three bedrooms. The interior of the house is beautiful with all the modern conveniences. Gillian has it perfectly decorated. The kitchen and dining room are state of the art with the best amenities. The bedrooms were big and roomy. The VRBO site only lists one bathroom and we were pleasantly surprised that the master bedroom also has a bathroom with a shower. The big draw was the hot tub. Our family took advantage of that every evening as we were winding down at the end of our day. The views were spectacular especially sitting in the hot tub. Gillian was great to work with and getting into the home worked perfectly. It is secluded and on the interior of the Ring of Kerry road. You cannot see another house from the location but you can hear the sheep. You definitely need a car to stay here. It was a pleasant and relaxing place to stay and our whole family would wholeheartedly recommend. Family of four had a great stay. Enjoyed the privacy. Cottage had all the comforts of home. Gillian was very helpful and went out of her way to make sure we were all set. The caretaker John is wonderful and has a sweet soul. Would definitely recommend this place to others and would stay here again. Just returned from a stay at Gillian's cottage in Waterville. Received great communication from Gillian from the moment we booked, including directions to find the cottage and information about the local area. The cottage was really spacious and very clean with comfortable furnishings and everything we could have possibly needed. The kitchen was large and well-equipped, the beds were comfy and very large and the DVD's, games and books kept our nephew occupied. We did meet the caretaker and neighbour, John, who kindly recommended places to visit nearby including the Ring of Kerry (highly recommended for beautiful sights)! Gillian also kindly offered us to stay an extra night free of charge, which was a really nice gesture. The hot tub was a real treat after a long day site-seeing. We will definitely be returning in the future. Misty October on Kerry mountains and the hot tub was exactly what needed! Kids really enjoyed it, settled into house like they were at home. Hope to return and would def recommend if it's a break away from life that's required. Thank you for a lovely stay, in a clean, well kept warm house with great views. Loved the house, lots of room and well kitted out. The hot tub was a fantastic addition. The views from the property was stunning, with a gorgeous mountain range. Very secluded which was just what we wanted and really fabulous beaches nearby. Kerry is definitely worth a visit, We'll be back to see more. Nestled on an elevated site, with a beautiful mountain backdrop , the cottage enjoys total privacy and amazing views which extend for miles over stunning, unspoiled countryside. Perfectly situated for a wide variety of activities, Cuanbeg is located approximately a 10 minute drive from Waterville and the blue flag Ballinskelligs beach on the world famous Ring of Kerry. Solid fuel fire, bar-b-q, linen, towels and gas are included in price. Electricity and heating charged at €6 per day. A €50 cleaning charge applies.